Denominations that formerly welcomed women in ministry often now oppose their ministry, not understanding their own history. 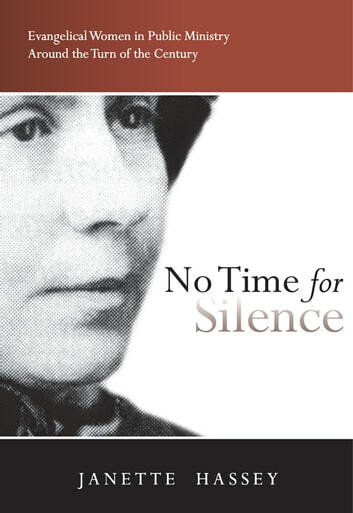 No Time for Silence documents evangelical women who taught at Bible institutes, preached at Bible conferences, served at local church pastorates, and evangelized and lead revivals more than 100 years ago. Debate over women's public ministry tends to focus on biblical and theological issues without grappling with the historical questions. Janette Hassey counters the popular but misleading claim that evangelical feminism (the movement for women's equality rooted in Scripture and evangelical Christian faith) is simply an accommodation to recent secular feminist and theologically liberal movements for women's rights. Rather, evangelical feminism in America first surfaced in the mid-nineteenth century and accelerated at the turn of the century. Those who endorsed women's public ministry were convinced that a literal approach to the Bible, and especially prophecy, demanded such leadership by women.